Thin knee-length socks made partly of merino wool. Good for summer use with your breeches, or for the gentleman who knows not to show any exposed skin from under his trouser cuff in any circumstances. These are superb: very comfortable, moisture wicking and durable. 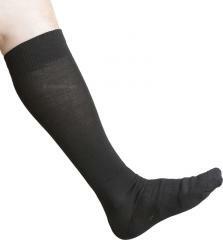 In addition, they make for excellent liner socks for outdoor use with any footwear, summer or winter. Light compression in two spots for a better fit! Made of 48 % Merino wool, 32 % polyamide and 20 % polypropylene. Wash in 40 degrees Celsius. The poly-things are there just to bring some durability - Merino wool this thin wouldn't last too long on its own. The sock will shrink about 10 % in the first wash. This is taken into account in the sizing. Malliltaan keskimääräistä parempi polvisukka, joka pysyy kiltisti ylhäällä. Tuntuma jalassa on kuitenkin hieman muovinen etenkin täyden työpäivän saapasmarinoinnin jälkeen. Tämän kun saisi 75 % villaisena, oltaisiin jo hyvin lähellä platonilaista sukan ideaa!